The ceety o Bern or Berne (German: Bern, pronounced [ˈbɛɐn] ( listen); French: Berne [bɛʁn]; Italian: Berna [ˈbɛrna]; Romansh: Berna [ˈbɛrnə]; Bernese German: Bärn [b̥æːrn]) is the Bundesstadt (federal ceety, de facto caipital) o Swisserland, an, wi (as o December 2015) a population o 131,000, the fowert maist populous ceety in Swisserland. 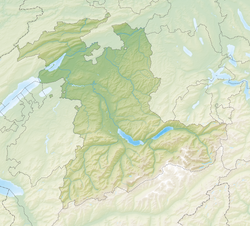 The Bern agglomeration, which includes 43 municipalities, haes a population o 349,000. The metropolitan aurie haed a population o 660,000 in 2000. Bern is an aa the caipital o the Canton o Bern, the seicont maist populous o Swisserland's cantons. The offeecial leid o Bern is German, but the main spoken leid is the Alemannic dialect cried Bernese German; maist residents o the ceety speak baith. Inglish an French are fairly widely spaken, but tae a lesser extent. In 1983 the historic auld toun in the centre o Bern became a UNESCO Warld Heritage Sites, an Bern is ranked amang the warld’s tap ten ceeties for the best quality o life. Wikimedia Commons haes media relatit tae Bern.